What our Digital Cameras see is very different from what we see. You can never accurately capture what your eyes see with your camera. There are many differences in the way your camera sees. This article describes one of these: Dynamic Range. First a definition is in order. The term f-stop and EV can be confusing - especially since they basically mean the same thing! If you change your lens aperture from f5.6 to f8, and you don't change your shutter speed or ISO, you are reducing your exposure by 1 f-stop or 1 EV. If you change your shutter speed from 1/125 second to 1/250 second, without changing your f-stop or ISO, you are reducing your exposure by 1 f-stop or 1 EV. If you change your ISO speed from ISO 400 to ISO 200, without changing your aperture or shutter, you are reducing your exposure by 1 f-stop or 1EV. Just as a reminder, when you increase your exposure by 1 f-stop or 1-EV, you are DOUBLING the amount of light that reaches your sensor. Likewise, when you reduce your exposure by 1 f-stop or 1-EV, you are HALVING the amount of light that reaches your sensor. The human eye can see detail in everything that is lit by light – whether it’s pure white or pure black. The sensor in your camera can only see a limited range of tones - about half of what the human eye can see. It cannot see detail in high-contrast scenes the way the human eye can. Consider the following chart showing the range of tonal values from pure white to pure black, broken up in 10 f-stops, where the center (0 f-stops) has a tonal reflectivity of about 18% (more on this “18%” value later). “Dynamic Range” is a term that indicates how much detail your camera’s sensor can see in shadow and highlight areas. Basically, Dynamic Range refers to the range of tonal values, from the brightest to the darkest, that your camera can capture detail in, in a single image. "Exposure Latitude" defines how much you can over or under-expose an image and still get an acceptable image. Note that when exposure isn’t “perfect”, you may get an “acceptable” image, but you will lose MORE shadow or highlight details (i.e. less dynamic range). When you view a scene with high-contrast – that is, where some areas of the scene are very dark and other areas are very light - your eyes can see detail in the entire scene. You can see detail in the shadow (dark) areas and you can see detail in the highlight (light) areas. But your camera can’t. Look at the following images – each taken one EV apart. They were all taken at f11, but the shutter speed was varied from 1/80 second to 1/640 second – a range equivalent to 4 f-stops. These are all un-retouched JPEG images except for re-sizing and cropping. First, let’s look at the highlights. As you can see in the left image, there’s detail in the red-circled area. The image on the right has NO detail in this area. Looking at a shadow area, look at the blue-circled areas (bottom-center of left & right images). The image on the left has NO detail in this area, but the image on the right does have detail in this area. When I took these images, I was able to see detail in everything, even the dome at the top of the image that is completely black in all of these images! The entire range of shadow to highlight (black to white) is about 10 f-stops. Thus, in a very high-contrast scene, to capture detail in the shadows you may need an f-stop of f2.8 to capture detail in the shadows and an f-stop of f90 (f2.8-f4-f5.6-f8-f11-f16-f22-f32-f45-f64-f90) to capture detail in the highlights. That’s a 10 f-stop range. If you were to take the image at an f-stop in-between those settings (something your camera does by design) you would capture the detail in the middle tones well, but would lose all detail in the shadows and highlights – even though you could see them well with your eyes. Have you ever taken a picture of a sunset where there was no detail in either the foreground or the sky – for example, the sky was washed out and didn’t have the nice color your eyes saw and the foreground was just a range of muddy dark-tones? That’s because your camera exposed for the middle tones, of which there were none! The scene had extreme highlights (the sky) and extreme shadow (the foreground). Your camera exposed for the “average”, but there WAS NO average tone in that scene – everything was either extreme highlight or extreme shadow. 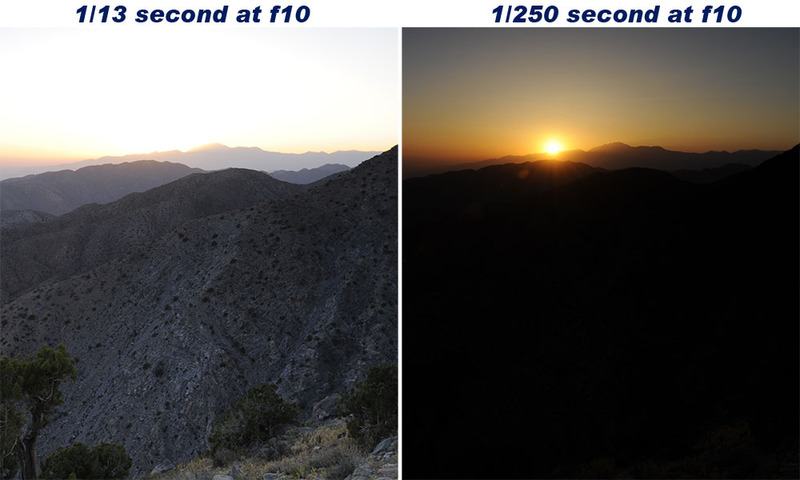 Here’s an example of a sunset taken at 2 different exposures, almost 5 f-stops apart. As you can see neither captures all the tones in the scene. The image on the left captures detail in the foreground; the image on the right captures the colors of the sunset. Your camera won't take either of these by design - you have to intervene. Sometimes, the inability of your camera to capture a wide tonal value range can work to your advantage, if you know about it and know how to exploit it. 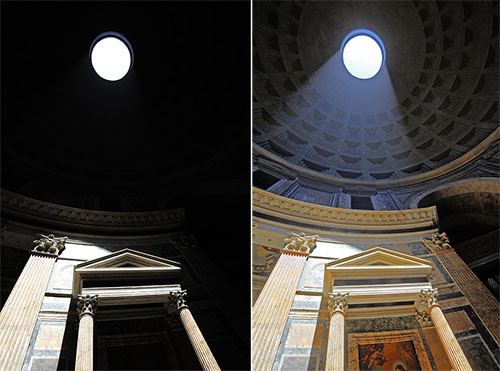 You can exaggerate the difference between light and dark to make images more dramatic. This especially works well with shadows. Shadows always get exaggerated in images, because of the reduced dynamic range available to us. In the 3 images below, I used shadows to my advantage. In the first flower image, although I could easily see the leaves in the background, they were in deep shadow. I knew that the camera would exaggerate this shadow area and record it as almost total black, thus emphasizing my subject (the flower). So I positioned the camera so that the shadow areas were behind the flower. In the middle image, I used shadows to add depth and interest to the image. When I viewed the scene with my eye, the shadows were barely visible, but I knew that they would be exagerated in the image my camera took. In the image to the right, without the shadows of the aspen trees, the image would have little interest. Exaggerated shadows can be very useful! RAW images capture MUCH more dynamic range than JPEG images (the difference can be VERY dramatic!). RAW images can capture much more detail in the shadows and highlights. It’s not perfect, but it can be significantly better than shooting JPEG images. But, RAW images require you to edit your images on a computer – something you may or may not be willing to do. But, your best opportunity for getting the best images you can, lies with shooting RAW. That's a topic for another e-tip, however (see Raw or JPEG - what's the difference). HDR software allows you to take two or more images, exposing for details in the highlights and shadows. The software then combines the images so there is better definition in both the shadow and highlight areas. But HDR software often makes images look quite "un-natural". I personally do not use HDR software very frequently, as I feel that there are better ways to control contrast. But, sometimes, it can come in handy. The image on the left shows the JPEG as the camera normally exposed the image. The image on the right shows a combination of 6 exposures – each taken one-EV/f-stop apart – merged into one HDR image (I used PhotoMatrix Pro to create the HDR image). You can see how the HDR image captured significantly more detail than the “normal” image did. Why your camera's exposure meter doesn't work right! Your camera tries to determine what f-stop and/or shutter speed to use to properly expose an image. It does this by measuring reflected light. But exposure is NOT based on reflected light - it's based on the amount of light generated by the light source (usually the sun, if shooting outside). So, your camera can get easily fooled. Look at the picture below: Two pieces of cardboard, one white and the other black. Both are lit by the same light (filtered daylight from a window). The picture on the left shows both pieces of cardboard. I let the camera determine the exposure. The image is exposed properly because the "average" tonal values metered by my camera is medium gray (combination of pure black, pure white and a gray rug in the background). I then took two more pictures, filling the frame with each piece of cardboard. These pictures are on the right. I again let the camera determine the exposure. As you can see, both images came out with the same tonal value: Gray. That's because the white cardboard reflects a LOT of light and the camera thinks that the light source is creating more light than there really is, so it underexposes. The black cardboard reflects very little light, thus the camera thinks that the light source is creating much LESS light than it really is, thus it overexposes. To get a proper exposure, your subject must reflect the same amount as an object with a tonal value of 18% gray - because your camera is calibrated to EXPECT a reflectance of 18% - if your subject isn't "average", it may be under or over exposed. To get the best dynamic range, you have to get a proper exposure. Many subjects have a range of colors in them, and may reflect an average as an 18% gray card would, so these exposures will be fine. BUT, some subjects don't reflect this "average" (scenes on a beach, snow, dark subjects, very dark or light backgrounds, etc.) - those images will be either under or over-exposed. The solution is to use an 18% gray card to determine your exposure. We carry one at all times in our camera bag. The 18% Gray card is one of the BEST and least expensive photographic tools you can own! You can see/purchase one here (sorry, US customers only). The important thing to remember, is that your camera cannot record what your eyes see. You can either look at this as a hindrance or an advantage! If you view it as a hindrance, you’ll never improve your images. You need to look at it as an advantage that lets you creatively improve the images you take by using your camera's limited dynamic range to your advantage. In some cases, you need to get a bit creative and either use exposure compensation, start shooting RAW and learning to edit your images on a computer or to use computer HDR software.